Technical data • protection grade: IP66 • rated working voltage: A.C.220V • rated power: no more than 120W • inlet specification: m20x.5, g3/4 • corrosion protection grade: WF2 Product features • this lamp is the lighting equipment for waterproof, dustproof and anti-corrosion type factory; • the lamp is composed of a light source chamber, an electrical cavity and an incoming line chamber, and is designed in a closed way; • the shell of the lamp is made of aluminum alloy, and the light source cavity is equipped with mirror reflector. 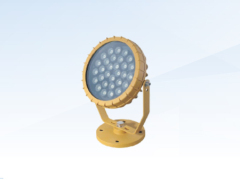 Polyester powder coating on the outer surface of the lamp; • the lamp is equipped with rubber sealing gasket with reliable sealing and excellent waterproof and dustproof performance; • the lamp has the advantages of good corrosion resistance, high luminous efficiency and durability. • the shape of lamps is novel and beautiful, convenient for installation and maintenance; • this lamp is applicable to L E D light source; • low loss, high efficiency, high power factor, cosine factor • extremely long service life, with a theoretical life of 100,000 hours.